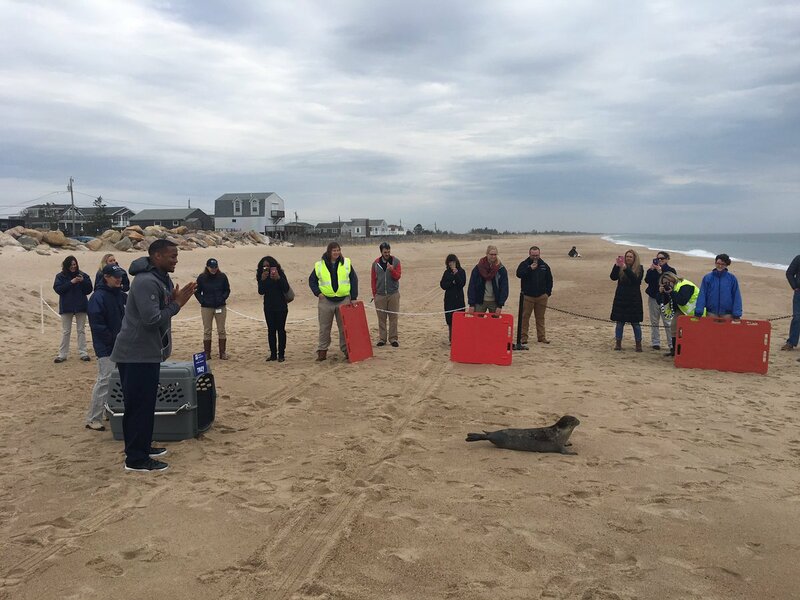 CHARLESTOWN, R.I. (WHDH) — A seal named after Patriots defensive end Trey Flowers will be released back into the wild Tuesday after being rescued off the coast of New York. The seal was found with several wounds on his flippers, neck and belly when it was rescued. He was just 30 pounds. Now at 48 pounds, the seal is healed and ready to return to the sea. The Mystic Aquarium’s Animal Rescue Clinic wanted to honor the Patriots’ Super Bowl win in a creative way and reached out to Flowers to set the seal free. A ceremony will be held at 10 a.m. at Blue Shutter Beach in Rhode Island. 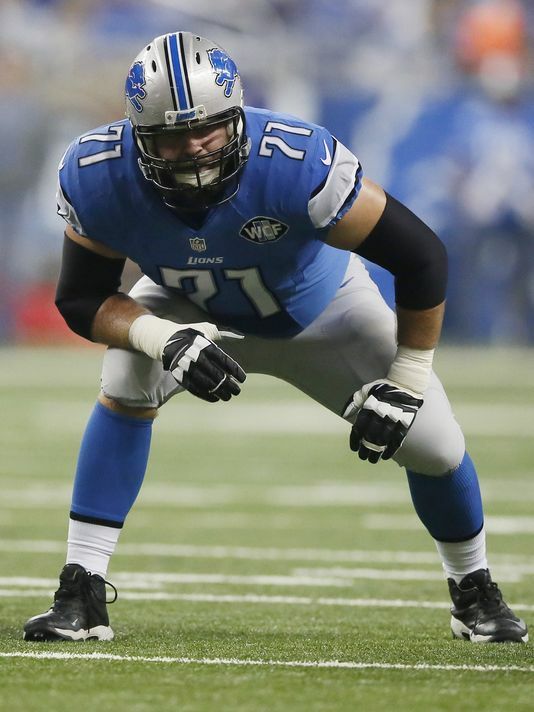 The interior of the Lions’ defensive line should get attention from general manager Bob Quinn through free agency, the NFL draft or both. Haloti Ngata and A’Shawn Robinson could start in 2017. Ngata played younger than his age (33) last season while Robinson got off to a slow start as a rookie but his improvement was clearly visible. Khyri Thornton, a restricted free agent, and Anthony Zettel, a sixth-round pick in 2016, could fit in the rotation. Tyrunn Walker, who had eight starts in 15 games for the Lions in 2016, and Stefan Charles who played in a dozen games for the Lions last season could both become free agents. NFL teams can start discussing contracts with free agents on March 7 and sign them starting at 4 p.m. on March 9. 1. Karl Klug, 28, could be a good rotational guy at defensive tackle or end. He’s 28 which is younger than many of the free agent candidates. However, he tore his Achilles’ in Week 15 and is unlikely to be ready for the start of training camp. 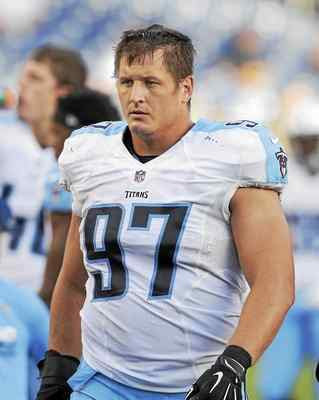 He’s spent the last six seasons with the Titans who could bring him back on an incentive-laden deal. In 2016 he had 26 tackles and 2.5 sacks in 14 games. 2. Tyson Alualu, 29, is an ironman of sorts missing just two games in the last seven seasons with the Jacksonville Jaguars. Blackandteal.com reports that he’s never lived up to his 10th overall selection in the 2010 draft but “has been a consistent presence in the defensive line rotation. Filling in at defensive tackle (where he was originally drafted to play) and also stepping in at defensive end on occasion.” It’s possible he could test the open market and while many teams could show interest he’s not expected to break the bank. 3. Alan Branch, who is coming off another Super Bowl win with the Patriots, has said he is not ready to retire. The 32-year-old defensive tackle, who played at Michigan, had 49 tackles (a career high) and two sacks last season when he made $2.4 million. Patsfan.com reports that Branch has been solid on the practice and playing fields. He was the Patriots’ most consistent tackle last year, as noted by coach Bill Belichick. It’s uncertain if the Patriots will bring him back or go with the younger Malcom Brown. 4. Sylvester Williams, 28, is not expected to return to the Denver Broncos where he has anchored the line for the past three years according to the Denver Post which also reported he was a part of Denver’s struggles against the run. That could be a red flag for the Lions. Last season William had 29 tackles and one sack in his fourth season in Denver. The Patriots pass rusher is already one of the most dominant defenders on the team and plays every spot on the defensive line. 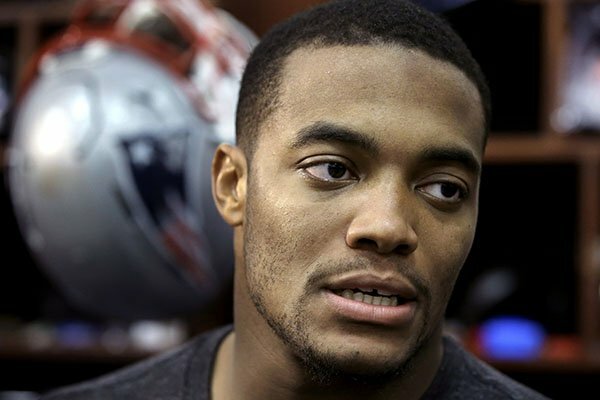 New England Patriots EDGE Trey Flowers stepped into the starting line-up halfway through the 2016 season. He ascended from 3rd on the depth chart to 1st over the course of his dominant sophomore season and ultimately capped of the year with a 2.5 sack, 1 tackle for loss, and 2 quarterback hit performance in Super Bowl LI. Flowers is still a relatively unknown commodity, but he’s primed to make a statement to the league in 2017 as one of the best up-and-coming pass rushers in the NFL. The most notable play by Flowers came late in the fourth quarter with the Atlanta Falcons in field goal position and looking for a single point to pick up a two-score lead. Q4 2-11-NE 23 (3:56) (Shotgun) M.Ryan sacked at NE 35 for -12 yards (T.Flowers). The 266-pound Flowers lined up in between the right tackle and right guard in what is considered the 3-technique, mirroring the placement of 320-pound DT Malcom Brown on the opposite side. DT Alan Branch is the nose tackle at the 0-technique alignment. Flowers undercuts Branch to split the guard and center, while Branch stunts behind Flowers to occupy the guard and tackle. Flowers drives All Pro C Alex Mack back into the lap of All Pro QB Matt Ryan for a 12-yard sack. The Falcons had been in position for a 40-yard field goal prior to the play, but were knocked back to the fringe of K Matt Bryant’s range at 52-yards. A subsequent holding penalty drawn by EDGE Chris Long ended any Falcons chance at a score and the Patriots held on to their one-score deficit. While the play call was great and Flowers executed it perfectly, Branch relayed how Flowers stepped up into a leadership role in crunch time. Flowers earned the trust of his teammates as he delivered on the field every time his number was called. He might not be the flashiest pass rusher, but he uses his long arms to create leverage against bigger offensive linemen and to get into the backfield to create big stops. What’s even more impressive about Flowers is his ability to generate a highlight play from any place on the defensive line. Flowers lines up in a wide-9 formation opposite the left tackle to give himself a more direct path to QB Matt Ryan. Flowers beats the left tackle easily with his inside arm warding off the contact and his outside arm beating the tackle’s arms. Flowers slings Ryan to the ground and almost forces a fumble-6. Flowers is lined up outside the left tackle again, but is closer to the line of scrimmage to help defend against the run. No Falcons blocker engages Flowers (were they trying to have a wide receiver crack block Flowers?) and he is able to knife into the backfield to tackle the ball carrier. Flowers shades on the inside shoulder of the tackle (offensive right side on the top image, offensive left side on the bottom image) in what could also be considered 3 technique in the bottom image. Flowers uses a spin move to get away from the double team in the first play and lays a hit on Ryan. The Falcons ultimately completed the play, but Flowers forced Ryan off his mark. On the second play, Flowers uses his inside arm to ward off the right guard in a potential stretch run, before ultimately swimming back to tackle the running back at the line of scrimmage. Additional kudos for LB Elandon Roberts for reading the run play perfectly and eliminating the cutback lane. Flowers lines up across from the center on a passing down and holds the point against a double team. A crashing Hightower occupies Mack and allows Flowers to have a one-on-one with the Falcons left guard, where Flowers uses his length and height to rip down and away from the block, before crashing the pocket and bringing Ryan to the ground. The Patriots play Flowers everywhere on the defensive line because he’s a mismatch at each position. Despite standing at 6’2, Flowers possesses arm length more similar to a player at 6’5 so he can both engage with offensive tackles and use his height to get under their blocks. Flowers is also stout enough to hold his own against interior linemen in the run game, despite his weight, and uses his length to ward off the blockers. 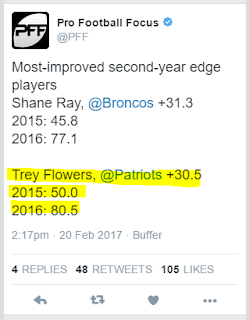 Flowers continued to improve as the season wore on after sitting out his rookie year. In a conversation with NESN’s Doug Kyed, Kyed noted that Flowers appeared to make the sophomore jump in the middle of the season. There’s a real chance that Flowers could return in his third season and experience an even larger increase in production. Flowers picked the biggest stage to introduce himself to the rest of the league and there’s no question that when Flowers receives even more opportunities in 2017 that he’ll find a way to deliver. This week Bengals beat writers Jim Owczarski and Paul Dehner, Jr. break down five free agent questions surrounding the club as they head to the NFL Scouting Combine. The “legal tampering” window begins March 7 and the new league year begins at 4 p.m. on March 9. 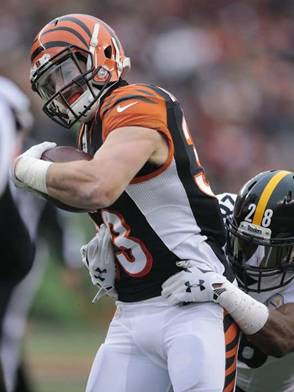 Over the final quarter of the Bengals season, running back Rex Burkhead assumed an opportunity four years in the making when asked to fill in for an injured Giovani Bernard (ACL). His moment couldn’t have come soon enough as he prepared to enter free agency with almost no regular season game experience at the running back position. He made the most of his opportunity. In fact, he rated as one of the most versatile and efficient running backs in football with his sample size. At the very least, he proved more effective than even the two backs that held the job before him, Bernard and Jeremy Hill. 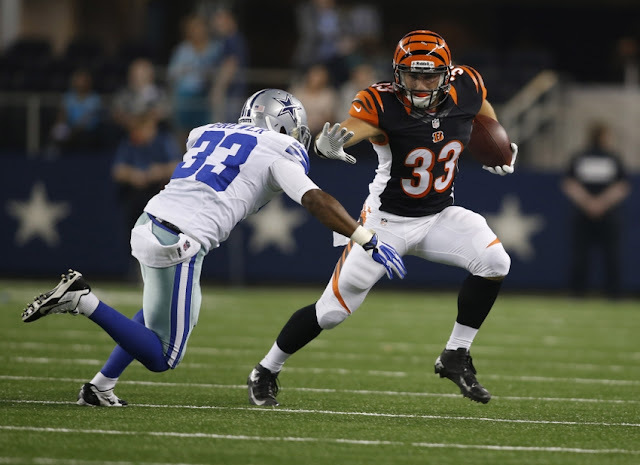 Burkhead, a 2013 sixth-round pick out of Nebraska, carried 74 times for 4.65 yards per rush. He also caught 17 passes for 145 yards. Meanwhile, Bernard and Hill both failed to cross 3.8 yards per carry this past season. 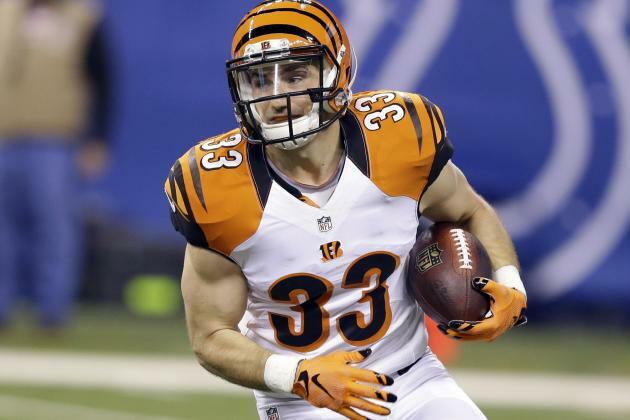 Burkhead not only hits the open market with a wave of momentum, he hopes to land an opportunity to finally play. If the Bengals can offer him a fair shot at playing time after proving his worth at the end of last season, striking a deal in Cincinnati shouldn’t be much of a challenge. 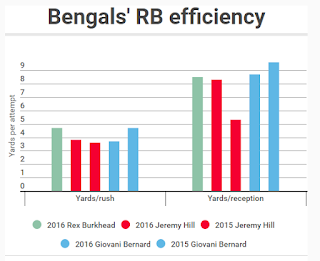 The question will come down to if Burkhead believes the opportunity will be given to him with the Bengals, a place where Hill and Bernard played ahead of him the entirety of their careers, or if he should look elsewhere for a greater opening to contribute as a central cog in an offense. Between Hill’s inability to cross four yards per carry the last two seasons and Bernard coming off an ACL, the possibility opens for Burkhead to see an expanded role. Offensive coordinator Ken Zampese opined on the possibility that a deeper rotation including Burkhead should have been part of the 2016 plan, keeping the option in place for next year. You could argue given the offensive structure, Burkhead was a more snug fit anyway. Zampese leaned more toward the pass than any Bengals season since 2012. Leaning more on the arm of Andy Dalton would mean leaning on the skill set of Burkhead. Remember, he was used as a slot wideout in the playoffs against Indianapolis in 2014 and came up as a seven-on-seven receiver in Texas. 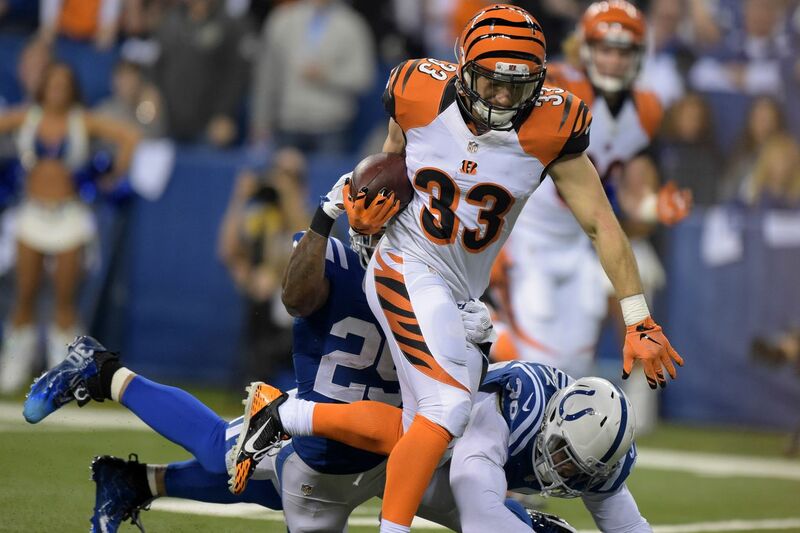 This past year Burkhead caught 17 of the 20 targets thrown his way, for 85 percent. 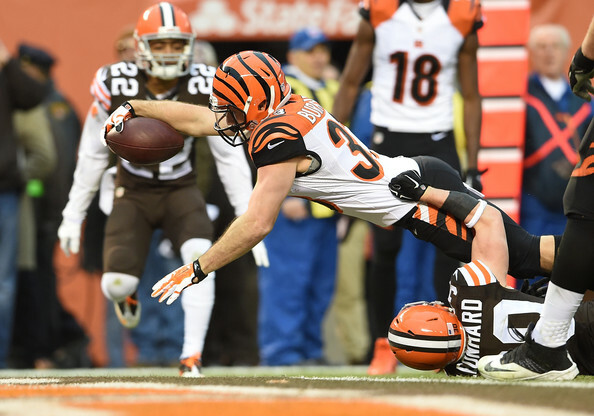 Of the 63 running backs last year to catch at least 15 passes, Burkhead ranked third in catch percentage behind only Seattle’s C.J. Prosise (89.5 percent) and Buffalo’s LeSean McCoy (87.7). Signing running backs to second contracts rarely play out as smart business in a league where the best years for most backs come at their cheapest rate. The top four backs in yards per game last year were all on their rookie contracts, as well as seven of the top 10. Burkhead breaks the mold a bit, having almost no tread on his tires from lack of use when he turns 27 in July. What also weighs into the equation would be a running back draft class loaded both at the top and in depth. Adding a cheaper, younger version of Burkhead in the middle rounds – where the Bengals will own four compensatory picks on top of their standard allotment – would be a reasonable fix. And a possibility exists the team makes a bold move for LSU star Leonard Fournette if available at No. 9 overall. Fellow running back and special teams standout Cedric Peerman also enters free agency, but if the team allows him to find another club, they could fill the four-back room with Bernard, Hill, Burkhead and a draft pick, then let the group play it out. The scenario would certainly sit well with the Bengals, but the question will be if that feels like enough opportunity for Burkhead. HOUSTON (CBS) — When Bill Belichick traded Chandler Jones, most people believed the Patriots’ head coach was making a decision that was best for the team. When Belichick traded Jamie Collins, some folks wondered if Bill had lost his mind. But, of course, the coach had not. The Patriots finished the season with the No. 1 scoring defense, and they finished the postseason as Super Bowl champs. 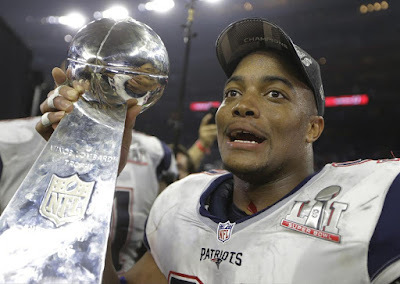 And while it takes a game-day roster of 46 men to win a Super Bowl, it’s fair to say this victory would not have been earned if not for the performance of Trey Flowers. 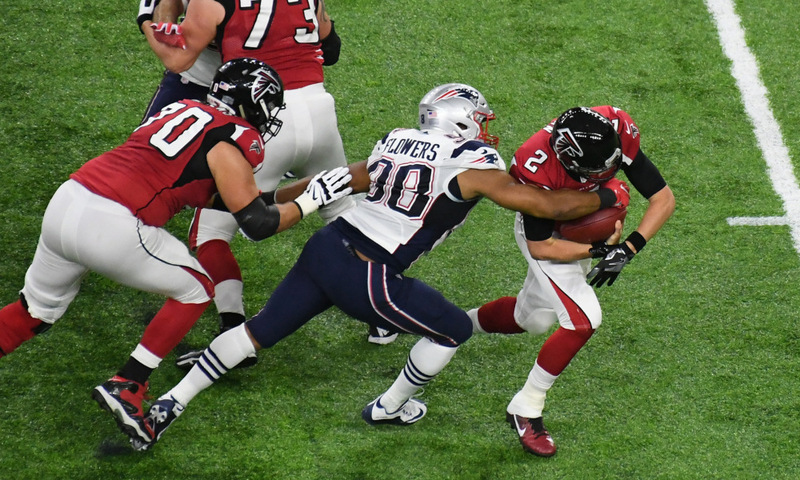 While it was Dont’a Hightower’s strip sack in the fourth quarter that has received a proper level of credit as being the turning point of the game, the fact is that the turnover would not have mattered if not for Flowers’ sack on the Falcons’ next drive. While the athleticism on display from Flowers throughout the night was evident with his six tackles and 2.5 sacks, what’s most encouraging for the Patriots is the young man’s confidence. 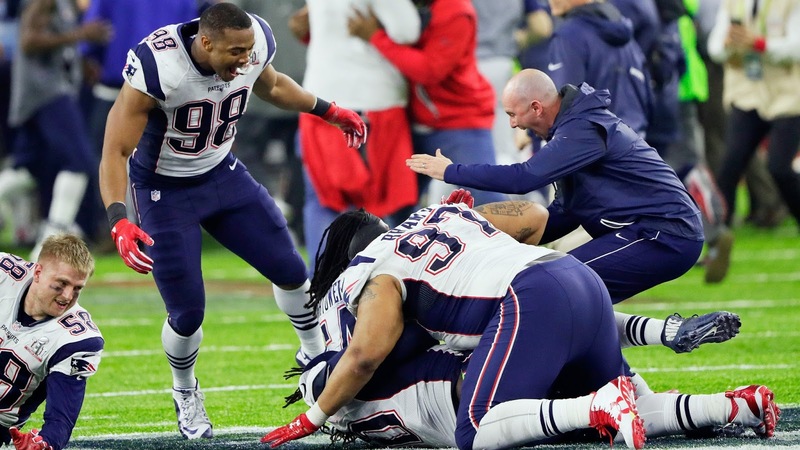 According to Alan Branch, it was the 23-year-old Flowers who told his teammates in the defensive huddle that he wanted to be the one to make the play. And he did. As Hightower explained, the entire defense felt that Flowers was the right man for the job at that moment. What happened next perfectly displayed Flowers’ explosiveness, strength, speed and sheer willpower, as he bullied his way through center Alex Mack and flung Matt Ryan to the turf. Despite the obvious individual effort required to make this play, Flowers opted to not talk about himself in the glow of a victorious postgame press conference. 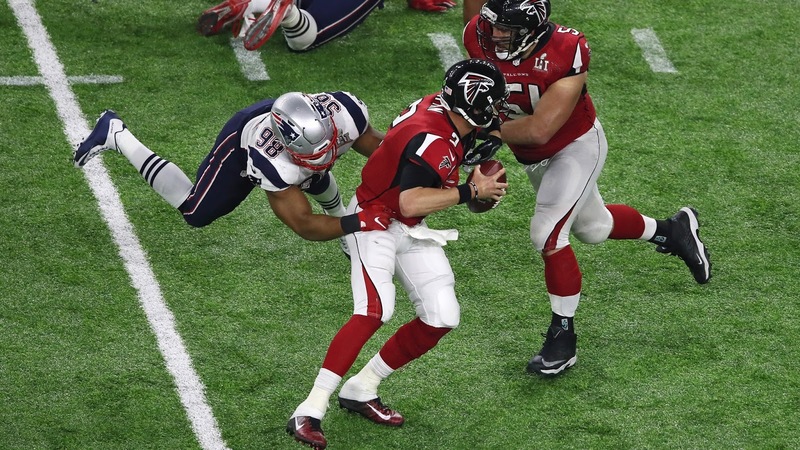 The sack came, of course, at a point in the game when the Falcons have been heavily criticized for not running the ball up the gut, forcing New England to use its timeouts, and then kicking a field goal to put the game likely out of reach. This is fair criticism. But to harp on the Falcons’ mental mistakes is to overlook the championship effort put forth by the Patriots’ defense at the time. Had the Patriots played like the game was over, they would have lost. Instead, they scrapped. And you know the final result. It was incredibly appropriate that on the next snap, it was Chris Long who drew the holding penalty on Jake Matthews. All season, Long has been an important contributor on defense, even if his impact was rarely measured properly by statistics. Though he didn’t get a tackle or a sack or a hurry or a QB hit on that play, it pushed the Falcons out of field-goal range and kept the Patriots’ hopes alive. While the flurry of events through the course of a 25-point comeback can lead to some blurred memories, there should be no downplaying the significance of that Flowers sack. The crunch-time play was really just a continuation of the night Flowers was already having. He came up with a sack on a third-and-5 on Atlanta’s opening possession to force an early punt (and nearly create a defensive score), and toward the end of the third quarter, he and Kyle Van Noy sacked Ryan on another third down to force another punt. That was an Atlanta drive, mind you, that began on the Patriots’ 41-yard line after a filed onside kick and a penalty on kicker Stephen Gostkowski. The high-flying Falcons offense should have easily been able to at least tack on a field goal. Instead, they were forced to punt. At that point, the Patriots still trailed by 19 points, and they needed every stop they could get. A third-down sack at that point in the game might have been overlooked in the moment. But after a comeback like that, its significance is known. That’s three sacks, all with a major impact on the game. The first two forced the opponent to punt. The final sack helped turn a 41-yard field goal attempt into a 53-yard field goal attempt, before the ensuing play ended up removing the field goal opportunity altogether. Take it all together, and that is the work of a defensive MVP. And now, as Flowers enters year three, he has a Super Bowl victory under his belt, and he’s progressing on a path to become the next dynamic, explosive player in that Patriots’ front seven. Turns out, this Belichick guy knows what he’s doing with his roster. Hightower, a highly accomplished defensive captain with five years and two Super Bowls on his resume, agreed. “Trey is honestly one of the best players on defense,” Hightower said. “He does a hell of a job each and every day, works hard, he’s great at his craft. There’s been plenty of times throughout the year where he’s had double-team, triple-team guys, and he’s gotten sacks. Prior to Sunday night, teams that trailed by 25 points in a game had won just six times in 2,655 opportunities. So to mount a historic comeback, it takes the contributions of dozens of players stepping up when it matters. 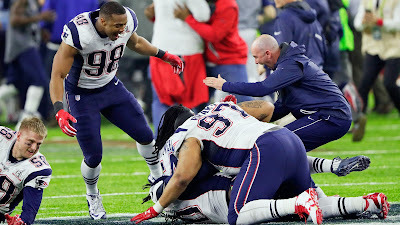 And while the offensive exploits of Brady and Co. have received their proper due, and while Hightower’s game-changing play has likewise gotten its fair share of attention, it’s only right to put it on the record that the Patriots would not have won this Super Bowl if not for the fourth-round pick out of Arkansas. 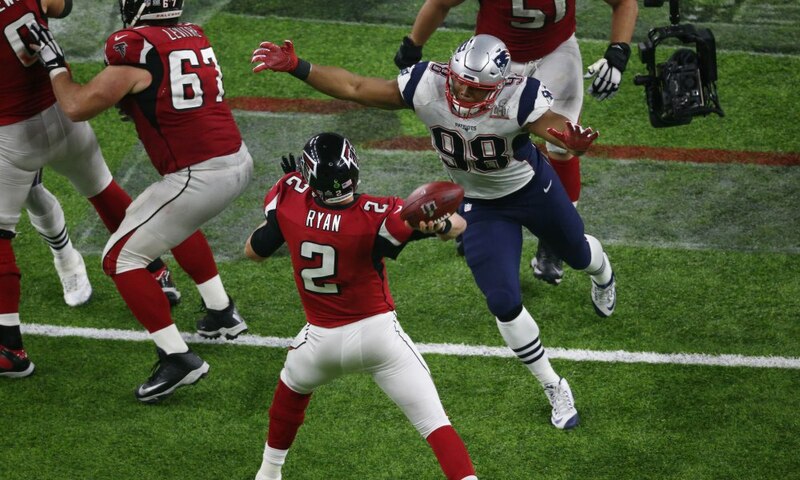 Trey Flowers pressures Atlanta quarterback Matt Ryan in the 4th quarter. HOUSTON - The Super Bowl is a stage where unknown players can turn into stars in an instant. For the Patriots, on the defensive side of the ball, no one had a bigger impact than Trey Flowers. 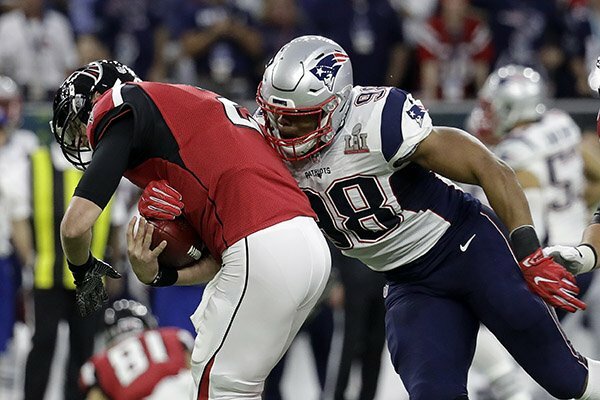 The second-year defensive end, who finished the season with a team-high seven sacks, might not have been a household name before Super Bowl LI, but he very well could be after the Patriots' dramatic, 34-28 overtime win over the Atlanta Falcons on Sunday. The 23-year-old finished with 2.5 sacks including a game-changing sack on Atlanta quarterback Matt Ryan late in the fourth quarter. 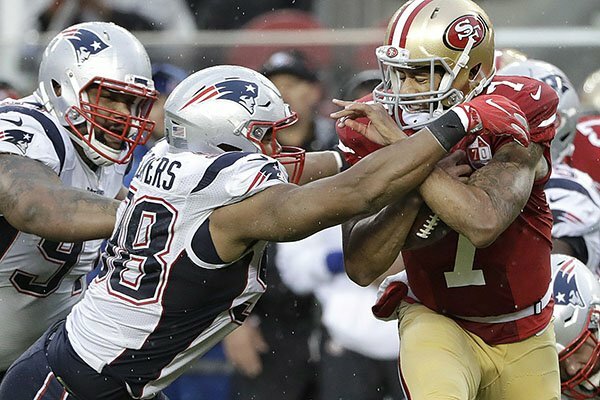 "Trey Flowers is one of the better players in this league," Alan Branch said. "He's definitely going to have a lot of people paying attention to him next year because, I mean, that guy's a monster. I think he's definitely one of the better pass rushers and all-around defensive linemen in the league." Flowers, who played in just one game last year, didn't start until Week 10. But when he was inserted into the main rotation, the Patriots defensive line changed for the better. That was clear on Sunday. On the Falcons' first series, Flowers came up with his first sack - on third down - for a loss of 10. "Last year, I didn't play a lot, but I saw the other side of it," Flowers said. "Being able to sit out and just the opportunity seeming to fade away, it could have. But I just keep playing and whatever my opportunity came I made the best of my opportunity and I just made sure I was prepared." With 52 seconds left in the third quarter, Flowers came up with his second sack - again on third down to force a punt. The Patriots offense was able to turn the next drive into three points, but the biggest play of the game for Flowers came at 3:56 of the third quarter. After a 27-yard catch by Julio Jones, the Falcons were in field-goal range. The Patriots likely would've lost if Atlanta got three more points, but two plays after the big catch, Flowers sacked Ryan for a loss of 12. The play pushed Atlanta out of field-goal range and the Falcons punted. Tom Brady took over after that. "It was a good play call," Flowers said. "I just went inside on the guard and just kept getting vertical. We knew he always likes to attack the spot and [Ryan] likes to step up in the pocket, so anytime you get some inside penetration, he was right there to get the sack. I was just blessed I had the opportunity to make the play when the time came." When the Los Angeles Rams added Mike Vrabel to their list of head coaching prospects, eyebrows rose. A linebackers coach who’s never been a coordinator, never mind a head coach, in line to run a franchise? It is unusual. But not because Vrabel’s ill-equipped to do so. He just was in a different stream than most coaches who saw their playing days end in their early 20s and -- loving football -- got into teaching it. Vrabel apprenticed differently. He rolled up 34 sacks in his final three college seasons at Ohio State and was a two-time Defensive Lineman of the Year in the Big 10. He was a third-round pick by the Steelers, and played alongside and behind some of the best linebackers of the 90s in a zone-blitzing defense. He signed with the Patriots in 2001 and was the equivalent of an on-field defensive coordinator in an amorphous defense that was ruthless, intricate and designed with logic in mind. Dealt to Kansas City in 2009, Vrabel was the Chiefs old head until retiring after two seasons and heading back to Ohio State to coach linebackers and the defensive line in consecutive years. As Belichick said in a statement in 2011 when Vrabel went to the Buckeyes, "During his Patriots career, there was no player more respected for his football intellect and revered for his leadership by his teammates than Mike. He was elected a team captain by his peers and is a player who I think everyone knew was destined to become a coach after his NFL playing career was over. "Mike Vrabel is as well-suited for coaching as any player I have ever coached. He has a tremendous feel for people, players, coaches and what his team needs regardless of the situation. He is outstanding in his knowledge of the game, which contributed to his excellence as a player. I have no doubt Mike will develop tough, intelligent, fundamentally sound winners." This year, Vrabel’s Houston linebackers have arguably been the strongest part of the Texans outstanding defense with Whitney Mercilus, Brian Cushing, John Simon and rising star Benardrick McKinney in particular having solid seasons. 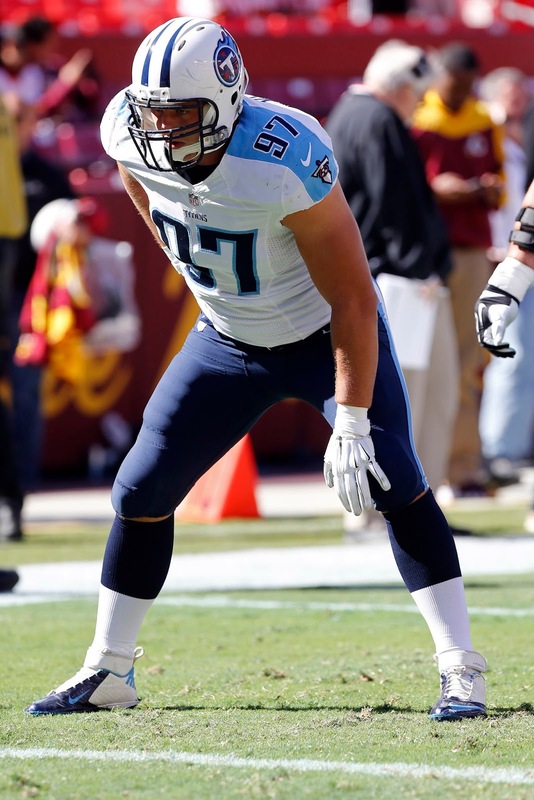 Vrabel is on the road less traveled because he had the ability as a player to take it. Trey Flowers, defensive end, New England. The second-year standout was a disruptive force Sunday night, recording 2.5 sacks for a combined loss of 26.5 yards. He sacked Matt Ryan for a loss of 12 yards in the fourth quarter with less than four minutes on the clock, and destroyed Atlanta’s best chance to score again and suffocate New England’s comeback. Flowers also led New England with five quarterback hits. FAYETTEVILLE — What number Trey Flowers wears may not be a big deal anymore. So it probably wouldn't be a motivational tool ahead of the Super Bowl for the New England brain trust to change his No. 98. At this point, Flowers probably plays as hard as possible every play. That's his reputation. It was in a sterling four-year career at Arkansas. It still is with the Patriots as a second-year defensive end, the starter on the right side for the Patriots on Sunday against the Atlanta Falcons. But it's worth noting that there was a time when Flowers did let a number change ignite a raging fire on the field. Robert Flowers, his father, recalls his son's ninth-grade season when the high school coach in Huntsville, Ala., gave No. 75 to a promising senior transfer. That was bad news for the move-in when the team scrimmaged. He lined up opposite Flowers. “He thought he was going to take Trey's position at defensive end, too,” Robert Flowers said. “Trey was playing offense, assigned to block him. That was a mistake for that boy. Trey whipped him up and down the field. Trey balled. “That kid kept 75 for the year, but the coach gave it back to Trey the next year. They eventually changed him to 88 because he was playing some tight end and he had to have a receiver's number to go out for passes. “I'm telling you, Trey beat the crap out of that boy. I don't think he ever cusses on the field, but he's pretty mean. Off the field, he's as nice as they come. But he gets mean out there playing." That's no joke. Flowers played in 49 games at Arkansas, starting 39 times. He was all-SEC as a senior in 2014 when he helped Arkansas record back-to-back shutouts against ranked foes Ole Miss and LSU. Flowers finished his UA career with 190 tackles, 18 sacks, an interception, 13 passes breakups and four forced fumbles. He completed his career as the active SEC leader and tied for second nationally in tackles for loss (47.5). The productivity was there from the start as a true freshman in 2011. He was part of a big defensive end class that included the more heralded Lonnie Gosha. Flowers was the last player added in that class, getting his only SEC offer from Bobby Petrino on the weekend before signing day. Flowers probably was headed to Georgia Tech until UA defensive ends coach Steve Caldwell talked him into visiting with a phone call late in January. The other schools interested were Alabama-Birmingham and South Alabama. Actually, Gosha played, too, and he was getting more snaps ahead of Flowers early in their freshman season. When starters Jake Bequette and Tenarius Wright suffered injuries, the freshmen playing time increased. Flowers played some in a reserve role against Texas A&M and Auburn before coaches figured things out. “They played others for most of the Auburn game, and just at the end of the game, with the score out of hand, Coach Caldwell put Trey in for the last two minutes,” Robert Flowers said. “Trey got three plays. He made tackles on first and second down and they took him out on third down. A little later they put him back in and he almost got a sack, forcing an incomplete pass. Flowers finished the season with 28 tackles, tied with Bequette, a senior, and three ahead of Wright, a junior. He was named to the SEC all-freshman team. The early playing time effected Trey's academic plans. He came to Arkansas with plans of an engineering degree. The path for that degree generally takes five years. “He could have done it if he'd had a redshirt year," Robert Flowers said. “Trey had the academic background. He was straight As in high school, really all the way back to grade school. “But when things started out so well as a freshman and he was playing, we had to rethink the engineering part. It was not going to be easy. There were some classes that had tests on Friday for the start of the engineering program. If you missed, you got an F. He was missing on travel weeks. “The plan when he went to school was to get a significant degree. He had an older brother go to Cincinnati for basketball and they put athletes in a cookie-cutter program, criminal justice; not significant. Trey was not going for that, coming out of high school with no Bs on his card. Flowers finished the economics degree in three-and-a-half years, making the SEC honor roll throughout. Nothing Trey does surprises his father. He's always had high expectations for his son, one of 10 children. There were older brothers with college scholarships, in football and basketball. If there was ever any doubt that Trey could make it in football, it came in the eighth grade. It wasn't just enough to play. Winning was always the goal. It was tough during his first three years at Arkansas. After an 11-win freshman campaign he had to endure the John L. Smith season, then a tough time in Bret Bielema's first season. Things took off at the end of Trey's senior season. “Man, Trey hated losing, always did,” Robert Flowers said. “I remember the first year he played peewee. He was coached by my college roommate. They only lost two games and Trey cried both times. He didn't understand losing. Me and momma talked to him about that. Obviously, the Patriots aren't losing much. It's been a fun ride this season to another Super Bowl. Robert Flowers said he has made it to seven games and the entire family is headed to Houston for the Super Bowl. It was about like that for Arkansas games when Robert used an oversized van for the trip from Alabama to the Ozarks. It was equipped with six captain's chairs, a requirement for some big people. “Trey plays it perfect,” Robert Flowers said. “You show him, he'll get it. He'll master it. He did. Flowers has been a destructive pass rusher at both spots this season. The Falcons might have to do what older brother Jamal thought would be required. They may have to resort to holding. 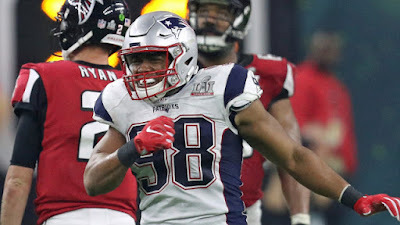 FAYETTEVILLE — Trey Flowers watched the Super Bowl at the same place every year when he was growing up: his family’s home in Huntsville, Ala.
“We threw a party every Super Bowl,” Flowers said. “We were a sports family and we loved football, so every time the Super Bowl came on, we’d have a good meal and a lot of people come over. The house will be empty this go around. 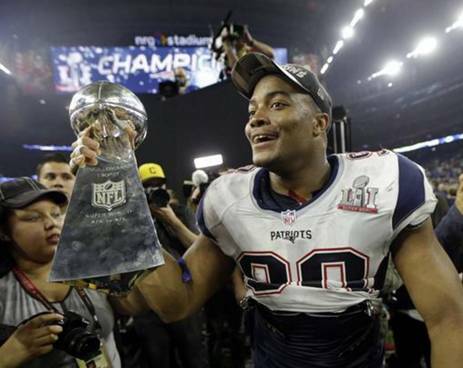 Flowers, a former Arkansas standout, is an integral part of AFC champion New England’s defense and will be in Houston as the Patriots face the Atlanta Falcons in Super Bowl LI on Sunday. About a dozen members of the Flowers family are making the trek to Houston. It’s a familiar trip, one they’ve made before. The last time Flowers took the field in Houston’s NRG Stadium also doubled as his final game in a Razorbacks uniform. The family was in attendance for that game, too, as Arkansas toppled Texas 31-7 in the Texas Bowl in December 2014. Flowers was a force as a senior for the Hogs, earning all-SEC honors and finishing with six sacks and 15.5 tackles-for-loss, enough to move him into second place in school history in career tackles behind the line of scrimmage (47.5). “Probably a guy that I bring up a lot to our players, even before he and Martrell (Spaight) came in and spoke before the Florida game (this year),” Arkansas coach Bret Bielema said. “… To see guys that you coached or developed or had a part of their life be at the highest pinnacle of football, it’s overwhelming." He’s emerged as a key presence for the Patriots, bursting onto the scene as arguably the best defensive player on the roster since late October. He led the team with seven sacks in the regular season, all of which came since week 8, which coincided with him earning a bigger role within the defense. His teammates bestowed him with the nickname, "Technique," as a result of his attention to detail and fundamentals, qualities often lauded by the coaching staff. The 6-foot-2, 265-pounder lines up all over the place on the Patriots’ defensive front. Sometimes he’ll work at defensive end, the position he played at Arkansas. He also can shift inside and operate as an undersized interior linemen. "I honestly haven't seen too many players with the size he is who can defend the run and the pass on the inside like him,” Patriots defensive lineman Alan Branch said to CSNNE. “He's the only one I've ever met like that." "He's able to play like he's 300 pounds, but he's not 300 pounds,” said Chris Long, another Patriots defensive lineman, to CSNNE. “It gives him versatility and he has a really good feel for where people are leaning. He's a really smart player. He's one of the smartest players on our defense and one of the best players, if not the best player, on our defense." Flowers has been disruptive in both spots, recording multiple sacks three times over the course of the last two months of the regular season. That versatility, made possible by Flowers’ talent and his keen knowledge of the playbook, is invaluable and has allowed him to take on an expanded role within the system. Flowers’ mid-season surge put him on the radar after he’d become a bit of a forgotten man when he missed most of his rookie season with a shoulder injury. A fourth-round draft pick, he wasn’t exactly a can’t-miss prospect coming out of Arkansas. But at least one New England teammate knew what to expect. Jake Bequette was a senior defensive end at Arkansas when Flowers was a freshman in 2011. Bequette, now in law school at Georgetown, was entering his fourth season with the Patriots when Flowers showed up for his first training camp as a rookie in 2015. Not much had changed from their time together in Fayetteville. Bequette was an all-SEC performer as Arkansas went 11-2 his senior year, Flowers’ freshman season. Flowers, a 3-star recruit, was forced into action out of necessity against, of all teams, his home-state Alabama Crimson Tide with Bequette and Tenarius Wright sidelined by injuries. Flowers performed admirably in front of family members in Bryant-Denny Stadium, especially given the circumstances. He wound up starting three games as a true freshman and finished his career as one of the most productive defensive linemen in school history. It hasn’t taken him long to make the transition from college to the NFL, either. Bequette knows first-hand. He’d switched to tight end by the time Flowers made it to Foxboro, Mass. “We went up against each other a couple times,” Bequette said. Bequette sent his former teammate a congratulatory text after the Patriots’ win over the Pittsburgh Steelers in the AFC Championship Game. He’ll be watching the big game on a TV somewhere in Washington D.C. on Sunday. 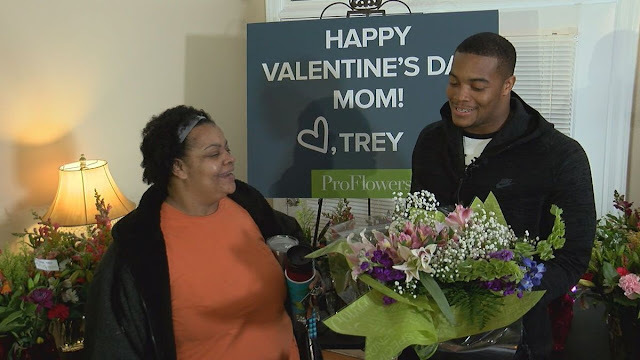 Flowers’ family traded in their annual Super Bowl party for a seat at the real deal this year as they support their burgeoning star. “I’m gonna have a lot of people down there supporting me,” Flowers said.